RED MORTAL OUT TODAY!! WOOT! With quiet, unyielding strength, King Leonidas has long led his fellow immortal warriors in battle against dark forces. But when Daphne, Oracle of Delphi, confesses to having loved him from afar, Leonidas soon finds his stoic shell breaking away as he becomes enraptured with the spritely beauty. For centuries, Daphne has yearned to experience the simmering passion locked within Leonidas’s heart. But just as their love begins to ignite, Daphne’s half brother Ares strips Leonidas of his immortality, causing him to age at an alarming rate. Now it will be only a matter of time before Leonidas is taken from her—unless they can find a way to challenge Ares together before Leonidas meets his mortal end...and the lovers are separated for eternity. To celebrate the release of RED MORTAL, Deidre has partnered with fellow NAL author Elle Jasper to give away the trip of a lifetime. All you have to do is tell Deidre and Elle why you deserve a romantic getaway and you could win 2 nights at the enchanting Lighthouse Inn on Tybee Island, Ga., near historic Savannah, a $500 travel voucher, and dinner for two at legendary Wiley's Championship BBQ. Click here to enter! Did you promise yourself that you’d finish a book by the end of the year and you haven’t come close? Or are you starting a new project and you need a kick in the pants to begin? The PLRW Writer’s retreat is a great way to separate yourself from distractions, join like-minded writers, and get the jump start you need. In 2011, PLRW’s retreat will be on a Carnival cruise ship scheduled to set sail to the northeast Canadian coast. The retreat is open to RWA and non-RWA members. Are you going to be one of the 35,000 fans expected to descend on Atlanta for Dragon*Con 2010 this Labor Day weekend? How do you plan to find your fave authors in the crowd? It's best to plan ahead, you know.... Deidre is organizing an informal fan meetup on Friday night @ 7pm for anyone intersted in having a little one-on-one time with her. Well small group time, LOL. If you're interested in finding out more details on the when and where, email Jia.Gayles(AT)knightagency(DOT)net. GHOST HUNTRESS: THE COUNSELING - in this fourth installment of Marley Gibson's popular GHOST HUNTRESS series, THE COUNSELING finds heroine, Kendall Moorehead at a crossroads in her life. Kendall has just discovered who her spirit guide really is, lost her boyfriend, and nearly died doing the thing she loves most–ghost hunting. It’s time to take a break and try to reconcile all the changes she’s going through. So Kendall heads to the Sierra Mountains, where there’s a camp especially for young people with gifts such as hers. It’s a time for reflection and self-discovery. But when she gets to California, she once again finds restless spirits–and the boy in her last vision. It may be the end of one chapter of her life and the beginning of a new one. 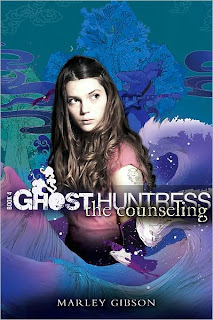 Check out Marley's awesome giveaway for GHOST HUNTRESS: THE COUNSELING on her website. The prize pack includes an autographed copy of THE COUNSELING, a one-of-a-kind ghost hunting blanket, a pendulum, and a signed copy of THE OTHER SIDE: A TEEN'S GUIDE TO GHOST HUNTING AND THE PARANORMAL, autographed by Marley. Marley Gibson is the author of the hit young adult paranormal fiction series, “Ghost Huntress,” from Houghton Mifflin Harcourt’s Graphia line. Gibson has been a lifelong paranormal enthusiast. 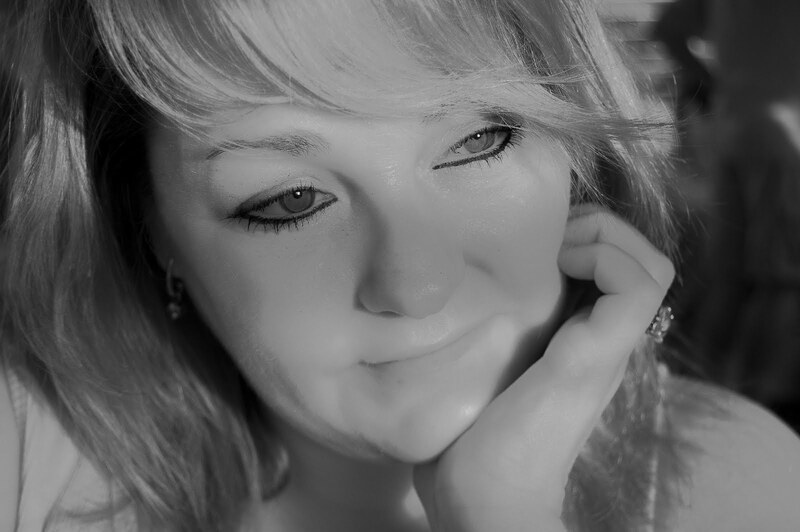 She started conducting paranormal investigations in August 2007 as research for her “Ghost Huntress” teen fiction series and has captured some very compelling pictures, videos, and sound files. Gibson was featured on the premiere episode of The Biography Channel’s “My Ghost Story,” as well as being interviewed by CNN.com for a Halloween feature on ghost hunting in 2008. Gibson’s publishing credits include “Ghost Huntress: The Awakening,” “Ghost Huntress: The Guidance,” and “Ghost Huntress: The Reason.” The next titles in the series “Ghost Huntress: The Counseling” and “Ghost Huntress: The Discovery” will be released in September of 2010 and May 2011 respectively. She has also co-authored a teen ghost hunting how-to guide entitled “The Other Side: A Teen’s Guide to Ghost Hunting and the Paranormal” with Patrick Burns and Dave Schrader. Gibson is also the co-author of the wildly successful “Christmas Miracles,” written with Cecil Murphey, from St. Martin’s Press. The sequel, “Christmas Spirit” will be published in the Fall of 2011. Gibson has investigated haunts throughout the USA, including Rolling Hills Sanitarium, Waverly Hills Sanatorium, The Sprague Mansion, The Houghton Mansion, The Stanley Hotel, and the Queen Mary alongside well known paranormal celebrities like Jason Hawes, Grant Wilson, Patrick Burns, Chris Fleming, John Zaffis, Shannon Sylvia, Chip Coffey, Stacey Jones, Mark and Debby Constantino, Tiffany Johnson, and many others. Deidre Signing with Jim Butcher and Shannon K. Butcher + Signed Parallel Books for Sale! It has been years since exiled alien king Jared Bennett thought of anything other than his people's fight for freedom. Now his rebel force has the one weapon that can turn the tide against their enemy: the key to the secrets of time. Victory has never been closer—but one woman has the power to change everything.Kelsey Wells can't deny that there is something unearthly about her fierce attraction to Jared Bennett. His revelations about alien wars and time travel can't possibly be fact—yet with every seductive touch, every searing kiss, Kelsey circles closer to the truth: that although Jared is exactly what he says, he hasn't told her everything. And when the future crashes into the present, Kelsey must decide if his deception will cost them the love that should have been their destiny. In the far reaches of Wyoming , the war between human and alien soldiers threatens to destroy the world. Alien warrior and royal guardian Marco McKinley takes his assignment as personal protector to beautiful soldier Thea Haven seriously. But in a time-bending twist of fate, the woman he loves is torn from his side as he is transformed into a vicious enemy of his own people. On a mission of vengeance, time traveler Scott Dillon finds himself marooned in the past—and risks disrupting the entire universe in his quest to destroy the warrior who killed his wife and unborn child. A never-ending passion for Scott lures Refarian medic Shelby Tyler to Texas, but the man she finds there is nothing like the man for whom she once cared. Reeling from his loss, Scott has lost himself in drinking and brawling. With her body, Shelby will lift him from despair. And with her heart, she will help him discover a part of his soul he thought was lost forever—and the devastating truth behind the murder of his wife. Dark and Stormy Knights Releases! 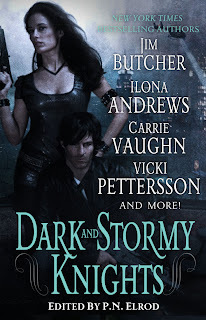 The highly anticipated DARK AND STORMY KNIGHTS anthology has finally been released. Contributors include Jim Butcher, Illona Andrews, Carrie Vaughn, Rachel Caine, Vicki Petterrson, Shannon K. Bucther, P.N. Elrod, Lilith Saintcrow and last (but certainly not least! ), Deidre Knight! Elrod has collected nine original stories by the modern masters of urban fantasy; an anthology that will both thrill fans and serve as a nice introduction to an increasingly popular genre. Several of the stories are set in the authors' series worlds but feature minor characters; Jim Butcher's “Even Hand,” for example, uses the landscape of the Dresden Files series but focuses on Chicago Mob boss Johnny Marcone. Carrie Vaughn's “God's Creatures” features Cormac, who must track down a rogue werewolf. All the stories feature knights of one kind or another, but none is the conventional knight of history. The entire collection is strong, but the two highlights are Rachel Caine's “Even a Rabbit Will Bite,” about two old foes, and Shannon Butcher's “The Beacon,” in which a reluctant hunter must decide the fate of a small girl. With some of the biggest names in urban fantasy contributing stories, this anthology will be an instant hit with fans. In "Beknighted," a talented puzzle maker's dreams are haunted by visions of a captive knight. Anna's incessant attempts to solve the intricate puzzle required to free him fail miserably – until a dark patron brings her the key to unlocking her knight's supernatural prison. But freedom comes with a high price, and the cost may be both the lives of Anna and the nameless man who mesmerized her from the shadowy confines of a dream. Love is Timeless Contest Winners!